Are You Caught In The Easy Trap? 00:08 – Is ‘easy’ a reality? Need more profitable business tips? 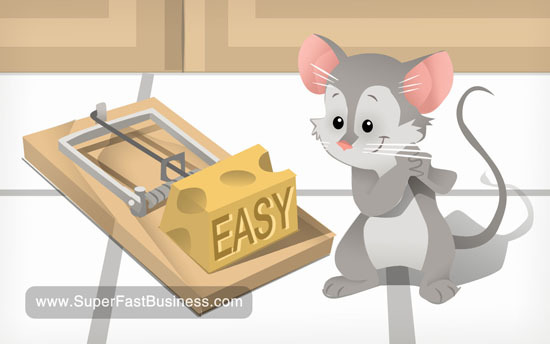 James Schramko here and today’s topic is the easy trap and how you can avoid falling into it. The reality is, some things are just not easy. They might be simple, but they might not be easy. So I think that a lot of the business fundamentals that have been around for hundreds of years such as good old fashion service and rolling up the sleeves and doing what it takes to get what you want, such as sweat equity – I believe they call it. That is not easy but it’s simple. The thing is, when you’re prepared to do some of the things that other people are not prepared to do, you can actually access some of the rewards that other people will never access. Have You Fallen Into The Easy Trap? Whenever I’m involved with a group of people and I’m talking about the subject of internet marketing or doing business on the internet, I find that the questions that follow always revolve around ease. They tell me that they’d like to get a website that makes passive income and then they want to learn about it, they don’t need to understand much about it. They just want to know how they can achieve that. Well the simple fact is, I don’t think that’s a reality. I don’t think it’s a reality to have a passive income website with no effort, no knowledge, no understanding. You would have to invest into something like that for a return and I think you’re going to need some knowledge to at least appoint someone to run a business like that. So, my main point today is, be prepared to put in a little bit of effort to get a result that most people will never see. There are a lot of things online where you can leverage and it does become easy. But usually there’s a more difficult step before the easy step. I would say that my business now, in some of my divisions have things running really smoothly. It only took six or seven years’ worth of continual effort to build it up to that point, that’s all. So, hope this has been useful and I look forward to catching up with you in the future video. I’m James Schramko. Found this useful, share your thoughts by leaving your comments below. I was sucked into the guru hype about “quick” and “passive” income and initially got very discouraged early on – and almost gave up. Thanks to a few amazing teachers like yourself I know see that you have to put in the time and do the work to get the rewards. I only wish I found you before all that wasted time. Thanks for keeping it real! Indeed and we are learning what to do and what not to do. We have just simplified our whole customer database and how we manage our territories. We are pruning and weeding to encourage the garden to grow. All good so far. This is too true. I try to got hat extra mile and create sites that little bit better content than most others. It is definitely worth the extra few hours it takes me. Too many people want to shortcut it like you said. They want the end result without having to put in the work. We all know, it doesn’t work like that – and if it did, it wouldn’t be worth doing because everyone else would do it too! I’m guessing the answer is, don’t start into a business idea thinking you’ll be able to do do little work and get a great reward. Is that right? Sort of like trying to compress a file down to 1 byte, by compressing and compressing… over and over. It just doesn’t work. You mean there aren’t any shortcuts to long-term, sustainable success? I think there are short cuts in the form of ‘doing the right things’. It is the ‘doing’ part people get stuck on first then ‘the right things’ eludes them. LOL It only took six or seven years’ worth of continual effort to build it up to that point, that’s all. Don’t fall into the trap of make money while you sleep without putting in a lot blood sweat and tears and disappointment. The Schramko mouse has the same face as the other Schramko cartoons. Great topic James, it’s always good to go back to the basics. I’m lucky in that I’ve never been sucked into the ‘easy-money’ schemes. I’m enjoying the so-called hard work of upskilling myself in the areas that will increase my chances of success. I think it’s part of the entrepreneurial journey. Having a money-making machine handed to me just wouldn’t be as fun or rewarding. The right things for me are customer service and keeping it simple.